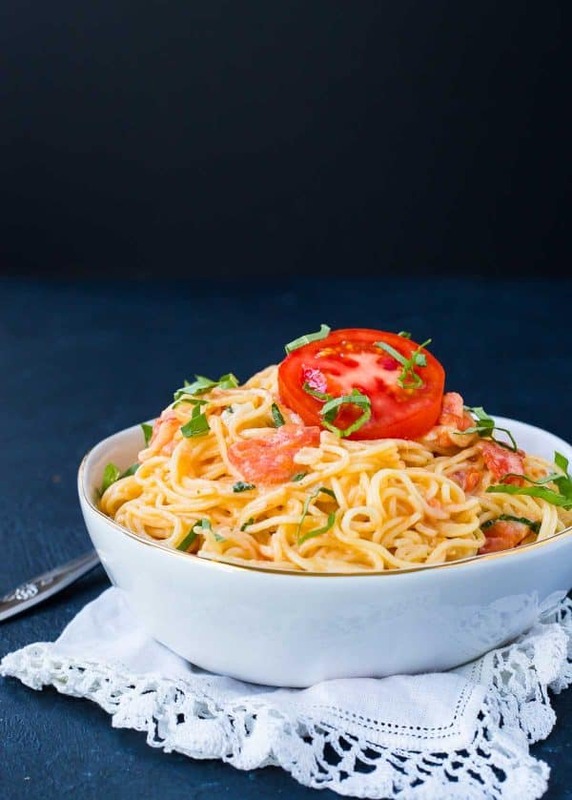 Fresh tomato cream sauce with angel hair pasta is a perfect spring and summer pasta recipe. It’s easy to make and is a great side with grilled chicken or fish. My mom calls this “pink pasta.” It’s one of my favorite ways to eat pasta and everyone that tries it loves it. It’s this irresistible combination of fresh and decadent that’s simply perfect. I love it when simple ingredients come together to shine in a recipe like this. Life doesn’t have to be complicated, recipes don’t have to be complicated. This no-fuss pasta shines in the most effortless, unassuming way. 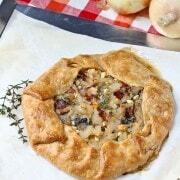 But yet it’s not rustic; it remains a classy dish perfect for any occasion. Maybe it’s the cream and butter. Okay, it’s probably the cream and butter. That dynamic duo will easily elevate any dish, am I right? 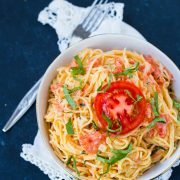 The great part of this tomato cream sauce is the use of fresh tomatoes – they’re the perfect complement to the rich cream base of the sauce. And don’t skimp out on the fresh basil. 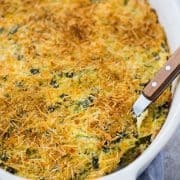 Many of my recipes are easily adapted and flexible to allow you to use different ingredients or even different amounts. This one however…don’t mess with it. Butter, onions, garlic, fresh tomatoes, heavy cream, Parmesan and basil. Just do it! On that note, in many (most) of my recipes, I use whole wheat pasta. In this one, however, I recommend traditional white pasta (angel hair is best!). 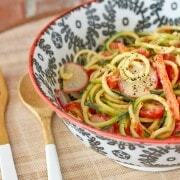 The tomato cream sauce is very delicate and light and won’t hold its own against a nutty, hearty, whole wheat pasta. 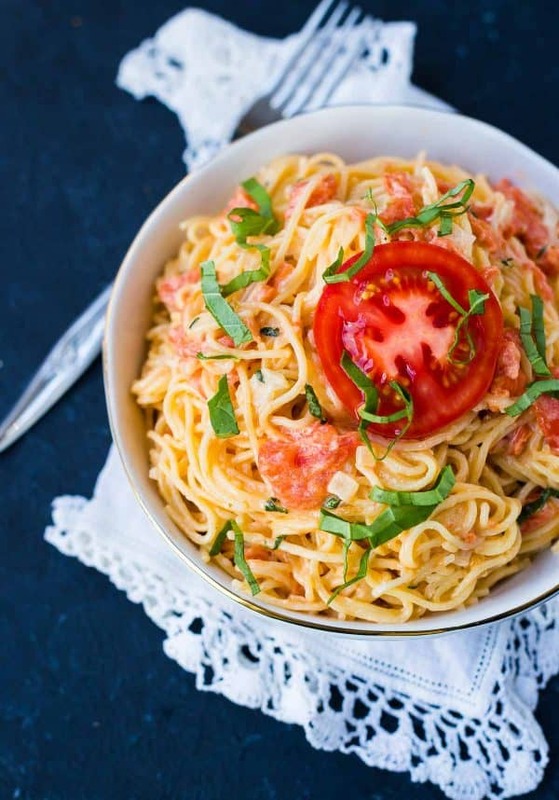 To review: Butter, onions, garlic, FRESH tomatoes, heavy cream, Parmesan, FRESH basil, and WHITE angel hair pasta. Trust me! 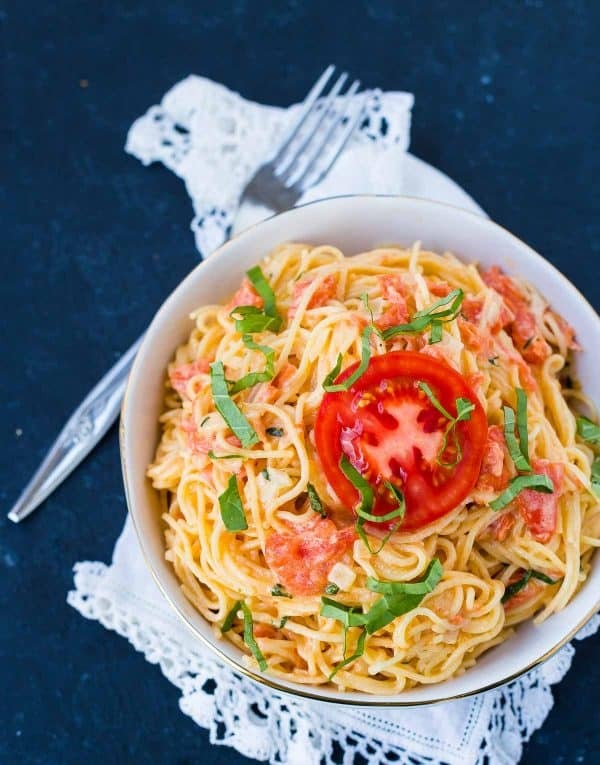 Fresh tomato cream sauce tossed with angel hair pasta is the perfect spring and summer pasta. It’s easy to make and is the perfect side next to grilled chicken or fish. Bring a large pot of salted water to a boil over high heat (see note about peeling tomatoes). Cook angel hair pasta as directed on package, drain. Meanwhile, melt butter in a large skillet over medium heat and saute onion and garlic until onion is translucent. Add cream and cook until reduced and thickened, about 10 minutes. Reduce heat to low and add tomatoes, Parmesan cheese, and basil and cook until sauce turns a light pink color. Mix in cooked pasta until evenly coated. Serve immediately topped with additional fresh basil. Note: To easily peel tomatoes, I use my boiling water before I put the pasta in it. Score a small “X” in the bottom of each tomato with a sharp knife. Place them in a heat-safe colander with a handle (or you can use a slotted spoon) and place them in the boiling water for 1-2 minutes or until you see the peels start to come away from the flesh of the tomatoes. Remove from boiling water and place in an ice bath (ice cubes + cold water). The peelings should come off easily once they cool. PS: you can’t go wrong with a few additional tomatoes so if you have extras, don’t worry! Note: I use whole wheat pasta 95% of the time when I cook, but for this recipe, white pasta is best. The sauce is delicate and goes best with white angel hair pasta. Verdict: One of my faves! Husband’s take: Ben loves this tomato cream sauce so much. Being a big pasta lover, I wanted to try this recipe. It was delizioso! So glad you liked it! Thanks for taking the time to come back and let us know! Total comfort food! I hope you try it and love it!